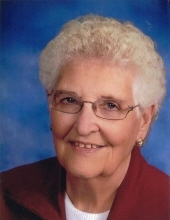 Patricia Darlene Martens, age 88, of Roland, passed away on March 19, 2019 at Israel Family Hospice House in Ames. Funeral service will be held at 11:00 A.M. on Saturday, March 23, 2019 at Bergen Lutheran Church in Roland. Friends may call from 5-7:00 P.M. on Friday, March 22, 2019 at Bergen Lutheran Church in Roland. Burial will be in the Roland Cemetery. Funeral arrangements are under the direction of the Soderstrum Funeral Home in Roland and online condolences may be left for Patricia’s family at www.adamssoderstrum.com. In lieu of flowers, memorials in Patricia’s name may be directed to Bergen Lutheran Church, the Roland Library, or the Roland-Story Elementary RIF program. Patricia was born March 29, 1930 in Nevada, Iowa to parents Albert M. and Genevieve V. (Campbell) Gibbs. She attended Nevada Schools, graduating with the class of 1948. Patricia was baptized into the Christian faith at the age of twelve at the First Christian Church in Nevada. Patricia married Lars H. Martens on August 19, 1951 at the First Christian Church in Nevada. They made their home in Roland, Iowa, where they raised their family of two daughters, Cheri Myers and Karen Jamison, and two sons, Alan Martens and Steven Martens. After her marriage, Patricia became a member of Bergen Lutheran Church in Roland, where she was an active member until the time of her death. Patricia was a stay-at-home mom until her youngest child started school. From 1969-1972 she worked as the Bergen Lutheran Church parish secretary. Patricia then worked for Central Iowa Mutual Insurance as an underwriter for thirty years, retiring in 1996, but remaining as part of the staff until fully retiring in 2003. Patricia was an avid reader and visited the Roland Library often. She loved crossword puzzles, walking, her Canasta card club and especially spending time with her family, grandchildren, and great-grandchildren, attending as many of their activities as she could. She was a long time member of the Roland Friends ‘N Service Club, the Roland Legion Auxillary, and her church women’s bible study group. Patricia is survived by her four children: Cheri (Kenneth) Myers of Roland, Karen (David) Jamison of Ames, Alan (Glenda) Martens of Des Moines, and Steven Martens of West Des Moines; six grandchildren: Amy (Michael) Risdal of Roland, Sara (James) Hoff of Roland, Matthew (Heather) Martens of Guthrie Center, Kelli (Robert) Martin of Ames, Lauren (Nicholas) Schalinske of Ames, and Samuel (Jenna) Jamison of Story City; nine great-grandchildren: Tyler and Lucas Risdal, Payton Carroll, Kendal and Jantzen Hoff, Mariah, Ryan, and Emma Martens and Violet Schalinske; a sister, Catherine Johnson of Story City; two brothers: Richard Gibbs of Dana Point, CA and Donald Gibbs of Des Moines; and many nieces and nephews. She was preceded in death by her parents; her husband, Lars in 2009; two brothers: Robert Gibbs and Michael Gibbs; and a very close cousin, Joan Evans. To send flowers or a remembrance gift to the family of Patricia Darlene Martens, please visit our Tribute Store. "Email Address" would like to share the life celebration of Patricia Darlene Martens. Click on the "link" to go to share a favorite memory or leave a condolence message for the family.